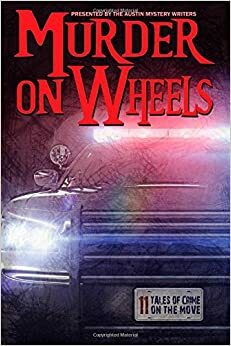 "Red's White F-150 Blues," by Scott Montgomery, in Murder on Wheels, Eleven Tales of Crime on the Move, presented by the Austin Mystery Writers, Wildside Press, 2015. The editors sent me a free copy of this book. Red Clark spends a lot of time taking care of his baby son, because the factory put him on half time and Britney has had to take on more nursing shifts at the hospital. One day his old friend Billy Ray - part-time drug dealer and non-stop trouble -- shows up to ask a favor. The bank wants to repossess his truck. Can he hide it in Red's garage for a while? Of course, Red says yes. Of course, Britney gets mad. While they're arguing about it - and about meatloaf and other affairs of state -- the TV announces that a guard was killed in a bank robbery. Police are looking for a certain truck. What follows are a lot of bad decisions, some startling secrets and - oh yes - a beheading. This is pretty much what Texas noir means to me. 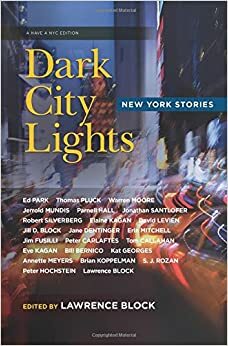 "Bowery Station, 3:15 A.M.," by Warren Moore, in Dark City Lights, edited by Lawrence Block, Three Rooms Press, 2015. I saw the girl standing on the Brooklyn bound side of the platform. You might not have noticed anything, but I saw the firsts clenched at her sides and I saw her lips moving, and I knew what she was gearing up to do. Can he prevent her from taking her own life? And if he does, what will happen next? This is weird. Last November at Bouchercon I was on a short story panel with Craig Faustus Buck, Barb Goffman, Paul D. Marks, Travis Richardson, and Art Taylor. Today the Mystery Readers International announced the nominees for their Macavity Awards, and look at the short story category below. Should I feel insulted? More like: I thought that was a pretty good panel. Buck, Craig Faustus. "Honeymoon Sweet." Murder at the Beach. Goffman, Barb. "The Shadow Knows." Chesapeake Crimes: Homicidal Holidays. 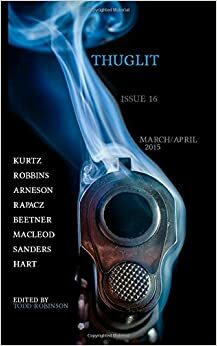 “The Proxy” by Travis Richardson, in Thuglit #13, Sept./Oct. 2014. Marks, Paul D. "Howling at the Moon," Ellery Queen's Mystery Magazine. November 2014. Richardon, Travis. "The Proxy." Thuglit, #13. Taylor, Art. "The Odds Are Against Us." Ellery Queen's Mystery Magazine. "Drone," by Rob Hart, in Thuglit, Issue 16. I can't find the name of the comedian who complained, approximately: "You always hear on the news about drug deals that went wrong. Why don't they ever talk about the thousands of drug deals that went right?" Because they aren't newsworthy, of course. And they wouldn't make very good fiction. So you can be pretty sure something is going to go pear-shaped in this tale of three crooks who come up with a brilliant new way to move cocaine around the city. Melinda is the bright one, and she has built a drone capable of flying five pounds of product. Billy the narrator, and his short-on-impulse-control brother Richie have the connections with a major drug dealer with the not-at-all-ominous name of T. Rex.. All they need is to demonstrate what inventors call "proof of concept" and they are in for a very profitable partnership. "Well, there was a wrench up on the roof, and I hit him with it, and that all turned into a thing." Yeah, I hate it when that happens. Good story. K.G. McAbee. "Dyed to Death," in Alfred Hitchcock's Mystery Magazine, July/August 2015. Last week I said my favorite story was all about setting. And here we are again. McAbee's story won the Black Orchid Novella Award, given each year bu AHMM and the Wolfe Pack for a novella that best carries on the Rex Stout tradition. The winners usually have a Nero Wolfe/Archie Goodwin format, meaning a great detective and an assistant narrates the story. This is true in "Dyed to Death," but as I said, it is the setting that is the true main character. It is the late twenties in a company town somewhere in the south. Our narrator is Sam, a boy in his late teens. He never recovered from an injury in the cotton mill when he was fifteen (the same mill killed his father) so he works at the company store. His boss is Guy Henson who, beside running the store is also the village constable. He also is a former millworker, but experiences in the Great War left him unable to tolerate loud noises. When Sam finds a woman drowned in the river, dyed purple from the weekly dumping of a mill vat, Henson has to find out what happened. Sam, a dedicated reader of Black Mask, is thrilled to be able to participate. I should say I didn't think the ending of this story was as strong as the rest of it. But McAbee gives us a strong sense of what life was like in a town where the mill owner set the rules and could throw you out of your home on a whim. I hope to see more of Guy and Sam. The Private Eye Writers of America have announced the finalists for the Shamus Awards. Congratulations to all the nominees!